Reporting in eTrack is powerful, customizable, intuitive, graphical and optionally ‘instant’. 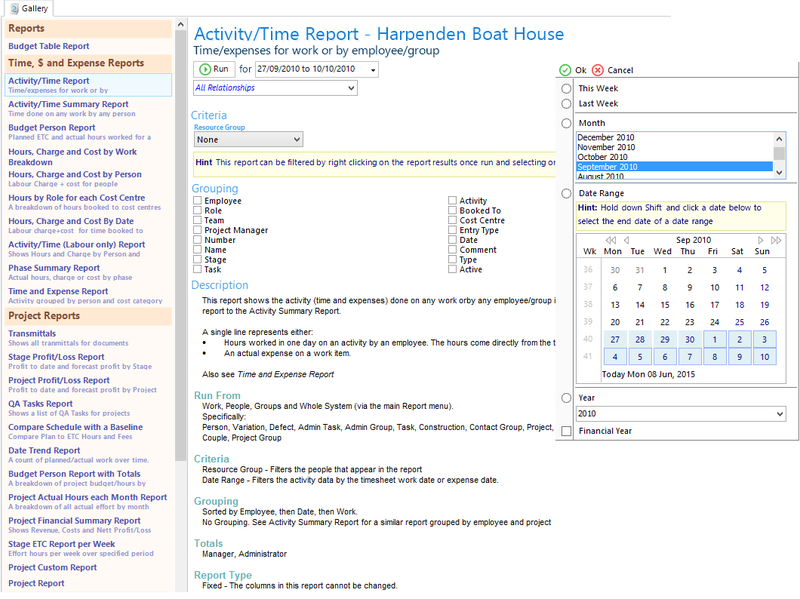 Many reports are available ‘out of the box’ and eTrack also comes with a built in report writer. Reports can be exported to many different formats such as .XLS, PDF, HTML, TEXT for further manipulation or publishing. Alternatively, a standard SQL Reporting tool such as Microsoft Excel or Crystal Reports may be used. Large reports may be displayed instantly by scheduling them to run using the eTrack Event Service and viewing the stored results. eTrack comes with many ‘out of the box’ Custom Reports which you can edit or develop your own using the built in Report writer. 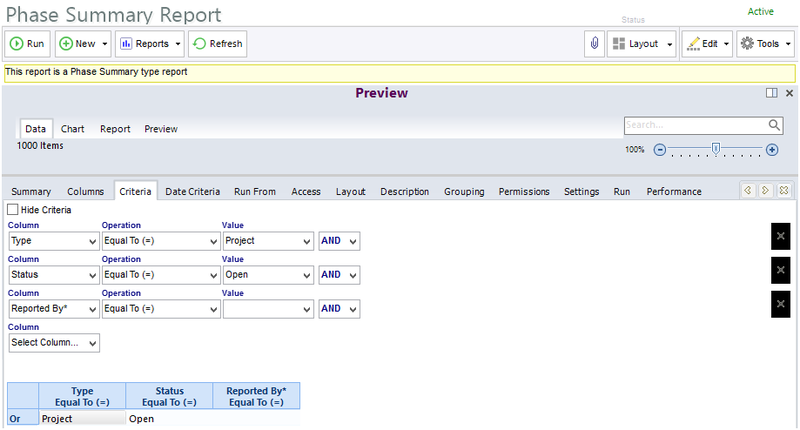 The report gallery shows all reports relevant to the currently selected tree item that the logged in user has security to run. 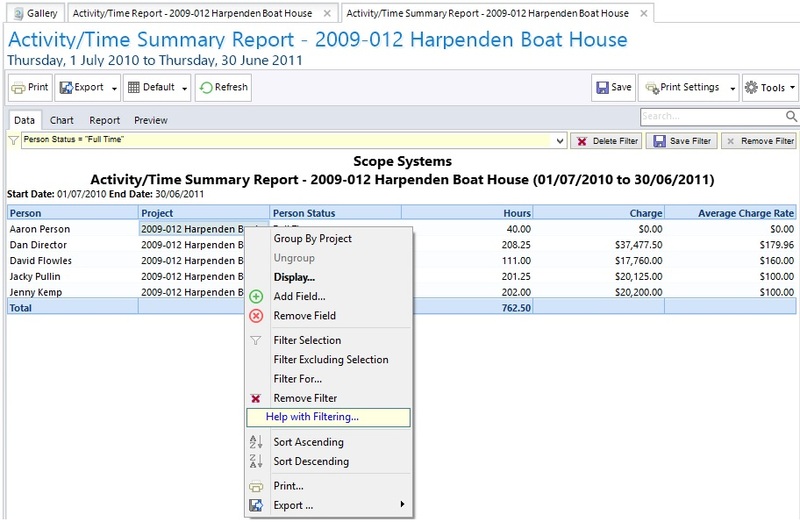 You can define your own report grouping and add business processes to the descriptions. Additional criteria can be selected and the result grouping defined. 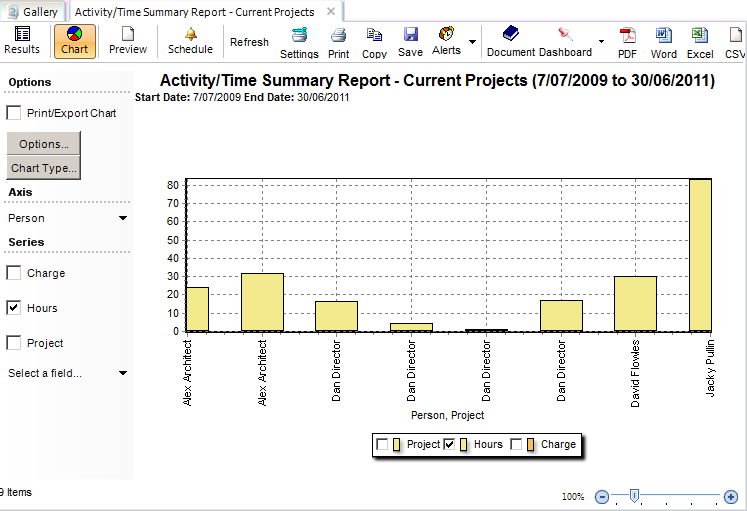 The following is an example of a simple project summary custom report that was created with the built in Report Writer, with date range selection criteria and some simple result fields. Run the report with either instant results from pre-calculated data or in real time data. Filter or sort results and drill down to see the details. Launch a predefined Excel file to automatically display pivot tables or graphs. Use Microsoft Word merge features for example to output the result data to letters. Graphically create database queries and select result fields from any field visible on a screen. Select from a range of pre-calculated fields (eg WIP) or mathematically combine fields. Predefine input parameters such as date range, status etc. Setup security and where accessed from in the tree hierarchy. Set default to either ‘instant’ reporting (using pre-calculated data) or to run in real time. If instant, set up when to run the report such as nightly. The following shows a custom project report being designed in the eTrack Report Writer where you define selection criteria, result fields and security permissions. Additional selection criteria can be defined at run time that dramatically reduces improves performance of very large reports. Standard reports can be run from many points in the eTrack tree hierarchy and have a selection criteria dialog allowing each to be run in various different ways. The result is a large number of possible reports. The results can be exported to many formats such as PDF, XLS, HTM, RTF (ie .doc). 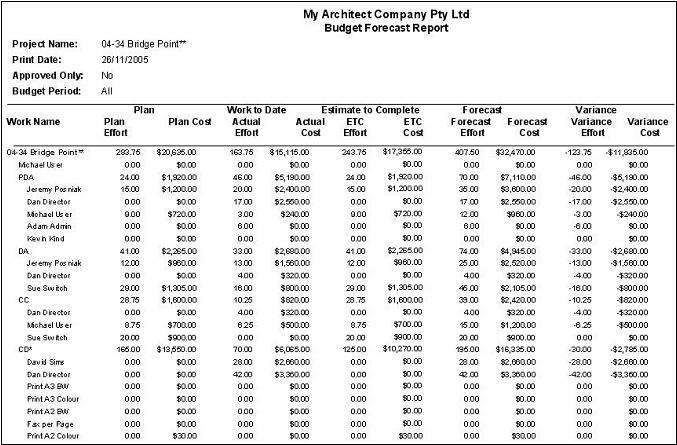 For example, the Budget Report below has been run for all active Projects with the option to show a single line roll up of each Project. It shows hours and dollars for the original plan, the actual hours from the timesheet, estimates to complete (ETC), and the calculated forecast (actual+estimate) and variance (plan-forecast). Or for example the Budget Report below has been run for one Project with the option to display all details including Stages, People and Roles, Equipment and Disbursements. Show all work done by all current staff for a week. Show work done on a project broken down by staff members. Show work done for a client broken down by projects. Show a summary of total hours and dollars done by each staff member for a project or client.